Liu lived in poverty during his childhood and experienced the "Down to the Countryside Movement" during his youth. To improve the living standards in impoverished areas, he called upon private entrepreneurs to develop projects and tap local resources to reduce regional disparity and promote common prosperity. Thanks to their joint efforts, the Guangcai Programme has made tremendous achievements over the past two decades. 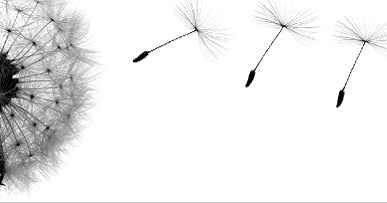 In pursuit of business profit, social responsibility is always our first priority. Since 1994, New Hope Group has invested over 5 billion Yuan in impoverished areas over the past two decades. The Group has built over 150 poverty-relieving factories in Xinjiang, Gansu, Ningxia, Sichuan, Chongqing, Guizhou, Hubei, Hunan, Yunnan, Jiangxi, Hainan, Henan, Shanxi and Shandong, which created more than 60,000 jobs and employed over 13,000 laid-off and/or transferred workers of state-owned enterprises. New Hope Group has continually innovated the approaches of poverty alleviation, shifting from project-based to industrial-chain-oriented efforts; from pure investment to integrated support combining investment, brand, talent and information; and from individual efforts to collaboration with partners. Thanks to those efforts, Guangcai Program has been gaining new momentum in different stages. New Hope Group is a key advocate of Guangcai Program in China. In April 1994, Mr. Liu, then Vice President of All-China Federation of Industry & Commerce, together with 9 private entrepreneurs, jointly released the Proposal Letter for Guangcai Program at the 2nd meeting of the 7th Standing Committee of the Federation. Within 63 days, New Hope Group built a feed production enterprise in Xichang, Liangshan, Yi Autonomous Prefecture, with a total investment of 10 million Yuan. The project is recognised as the No.1 Initiative of the Guangcai Program. The enterprise is mainly engaged in the production and sales of various animal feeds, with an annual yield of 30 thousand tons. The annual revenue in 2013 was 100 million Yuan. More than 300 farming households in the area have been engaged in animal husbandry and each of them had an annual income increase of over 3,000 Yuan. 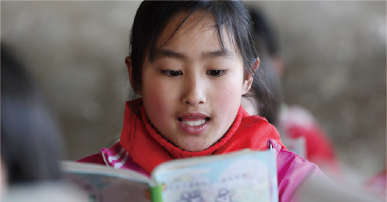 Since 1994, New Hope Group has invested more than of 2.6 billion Yuan in the Program. More than 40 poverty-relieving factories have been set up under the framework of the Program in Xinjiang, Gansu, Ningxia, Sichuan, Chongqing, Guizhou, Hubei, Hunan, Jiangxi, Hainan, Henan, Shanxi and Shandong. New Hope Group is an active practitioner and explorer of the “new rural” construction. 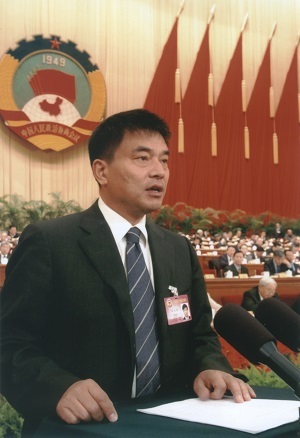 During the NPC and CPPCC in 2006, Liu and 38 NPC and CPPCC members jointly proposed an initiative for new rural construction. The initiative aimed to build village-enterprise partnerships. It won full support and rolled out in the country. As the initiator, New Hope Group took the lead. In 2006, it launched a joint initiative involving governments, enterprises and villages. Since 2007, New Hope Group has continually innovated the operational mode of the Program to boost economic growth in rural areas. Adopting the mode “company + cooperative + family farm”, New Hope Group has driven and supported the evolution of the agriculture and animal husbandry industries. By providing quality materials, technical support for cultivation, disease prevention and financial support, together with marketing, New Hope Group has established relationships with and supported thousands of specialised cooperatives and family farms; lifted over 100 villages from poverty; grown more than 50,000 mu of bases for raw material planting and animal husbandry; and increased local villagers’ annual income by 1,000 Yuan on average. A cornerstone of the 13th Five-Year Plan is “precision” poverty alleviation. New Hope Group has vigorously developed modern pig farming with an aim to lift 10,000 farmers out of poverty within 3-5 years. New Hope Group leverages its reach and depth of knowledge to enhance the animal husbandry sector: building hog farms, feed factories and technical support teams; providing financial support services; and helping local farmers build family farms. The Group carries out local precision poverty alleviation through the mode “company + family farm”, i.e. the company supports the weaknesses of traditional animal husbandry in capital, market and technology. By providing farmers with materials, technical support, together with sales and marketing, the Group improves the farming efficiency, reduces farming and market risks and maximises their revenues. The Group ensures the minimum margin of each pig (150 Yuan) and the scale of each farm (1,000 pigs), so that the annual profit of each farm shall be no less than 150,000 Yuan. This project shall lift participating families from poverty through moderate and modernized farming system. New Hope Group has kicked off pilot projects in Mianyang, Liangshan and Yilong of Sichuan Province, and will roll out to other provinces where conditions allow. The system will not only enhance pig farming, but also contribute to precision poverty alleviation and facilitate sustainable development of modern animal husbandry. 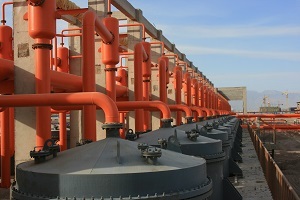 September 2009 The PVC and potassic fertilizer producer - Gansu Xinchuan Company - invested by the Group with 1 billion Yuan kicked-off production. The project contributed significantly to local poverty reduction. 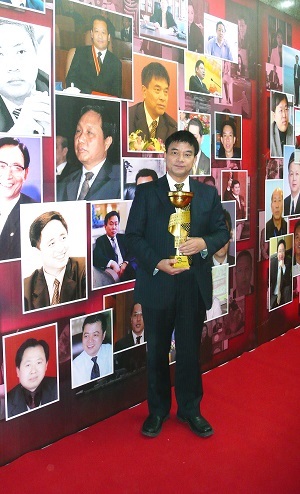 December 2007 Liu was awarded Man of the Year of the Guangcai Programme. 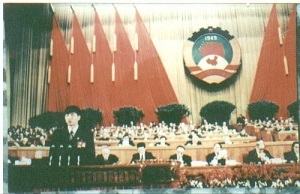 March 2006 Liu delivered a speech on New Rural Construction at the NPC and CPPCC. 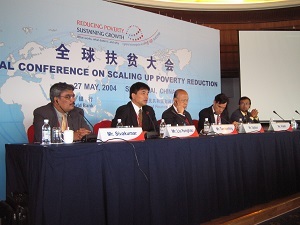 May 2004 Liu attended the Global Conference on Scaling Up Poverty Reduction. 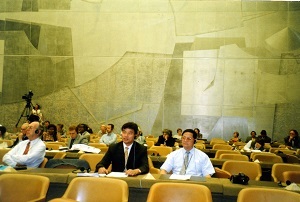 28 June 2000 Liu attended the United Nations NGO Symposium on Social Development in Geneva, Switzerland. He presented the Guangcai Program to over 700 representatives from all over the world. 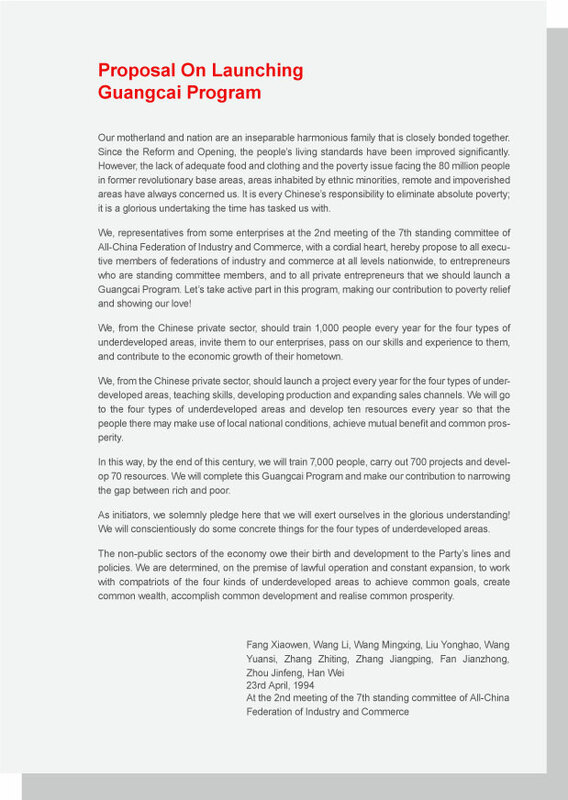 2000 Liu presented the Guangcai Programme during his speech at the UN ECOSOC. 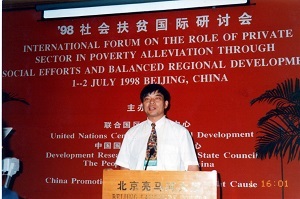 June 1998 Liu delivered a speech at the UN International Seminar on Poverty Reduction. 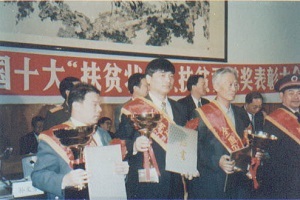 In the same month, he won the national Guangcai Program Medal. 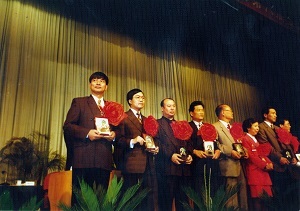 26 September 1997 Liu was given the honorary title “Top 10 Contributors to Poverty-Relief”. 25 October 1995 Executive Committee of the Guangcai Program Promotion Association was established. Liu was appointed Vice Chairman. 28 July 1994 The Guangcai Program Committee of All-China Federation of Industry & Commerce was established, and Liu was appointed the Deputy Director. 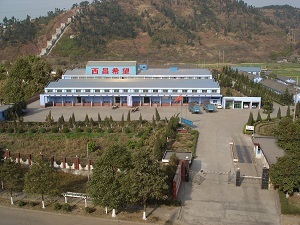 21 July 1994 Liu invested 15 million Yuan on a poverty-relieving factory in Liangshan, Yi Autonomous Prefecture, Sichuan. 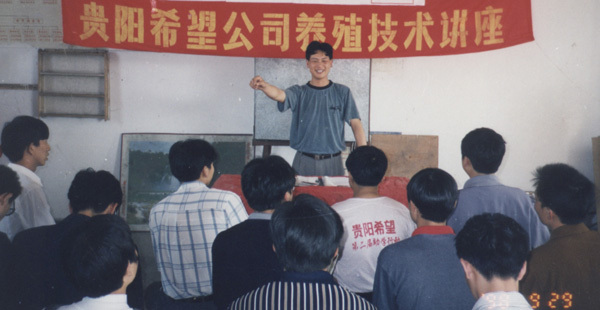 21 April 1994 Liu jointly initiated the poverty alleviation proposal for the Guangcai Program, which evoked wide response from the private sector.